Molded Melamine Resin Café Tables: Hard, smooth and heavy molded melamine table tops are made of a molded wood/resin body with a fusion bonded melamine top; Stain, burn, scratch, and fade resistant. These resin cafétables clean easily with soap and water. Our commercial patio and cafétables are specifically designed and engineered for intensive indoor/outdoor use. Synthetic Metal Finish Resin Furniture: Kevring®, a proprietary resin formulation, has the look of cast metal. Metallic flecks in the finish that give the material added dimension and beauty. Kevring® is environmentally correct and holds up to the toughest outdoor elements. It won't rust, resists fading and staining, and remains cool in the hot sun. These resin patio tables and resin cafétables are a testament to the elegance in design, making synthetic metal resin furniture perfect for any setting. The Sunset Patio Collection provides a touch of summertime styled elegance indoors or outdoors. The exquisite, modern flare showcased in the table and leg frame design provokes an inspiring accent, while the one-piece contoured chair sling delivers inviting comfort. Air Molding Technology allows the production of sleek light weight furniture designs with superior strength. AMT in consort with Grosfillex's proprietary technopolymers produce entirely unique ultra-lightweight café furniture with an exceptional durability. Creating a natural outdoor patio seating area, the uniquely styled Essenza stacking armchairs make for a welcoming spot to relax and enjoy. Low maintenance and cool under the sun, the armchairs are colorfast and stackable for easy storage. Synthetic Wood Finish: Rexform® Patio Café Tables and Chairs, a patented resin composite made with natural organic elements, replicates the beauty of teakwood with a durable material that is easy to maintain - at a fraction of the cost. All resin furniture made with Rexform® feature a textured wood grain that enhances the authentic look and feel of this furniture. Rexform® will retain the beauty of its original color. Synthetic Wicker Finish: Patio Café Tables and Chairs MPC®, is the result of years of research and development to mold a new material which allies the strength and the structural integrity of natural mineral materials and the resistance to the elements of the finest grades of synthetic resin, MPC technology allow the production of unique furniture details and designs such as totally smooth table surfaces, fine table edge textures and quality textures of chairs, front and back; no hollow chair backs any longer! Environmentally friendly, MPC is 100% recyclable! Tempo and Domino chairs are unique, 2-color designer chairs with a 'bubbly' personality, modern design with hints of the past, strong metal legs, and hard wearing foot pads. 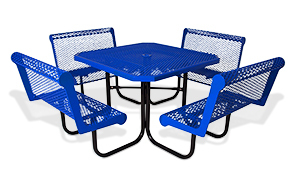 Modern day cafeteria and patio furniture requires the right mixture of stylish design, practical features, and built in comfort for the ultimate guest experience. Tempo and Domino are indoor/outdoor stacking chairs specifically designed for versatility of use in many contemporary environments. HPL - High Pressure Laminate: Considered to be one of the most durable decorative surface materials available in today's market place. The combination of organic material, melamine resin, high pressure and heat – results in a material that offers highly durable and exquisitely decorative surfaces with a host special performance properties. Resin Furniture: 100% U.V. resistant prime resin. It's a material naturally impervious to salt air, chlorine, and most common food and environmental stains. Low maintenance - no refinishing, and easy to clean with soap and water.